Virtualization power management is yet another way a hypervisor can help cut costs to achieve maximum ROI, with the added bonus of saving the Earth. Many people attribute virtualization’s cost savings to server consolidation, but you can also shave some kilowatts off the electric bill with the use of virtualization power-management controls found in most hypervisors. These features will not only save your IT department some money but also support Earth-friendly, green initiatives. There are a couple of ways to regulate power usage in virtual environments: Either by controlling how hardware components use and deliver power, or by monitoring how the virtual environment uses all of the hardware resources and adjusting for capacity and load. Chipset makers have created settings, sometimes referred to as Operating System Control, which allow for the management of the power subsystems and all it settings. In addition to hypervisors, pretty much all of the today’s modern OSes have functionality built-in to control hardware power settings through this option. In the latest CPUs, the control switch is known as the power state, or P-state, which regulates how much power is consumed by the onboard processors. In previous chips, the power states were either not directly configurable via the BIOS or had very limited functionality. Hypervisors can now monitor and moderate the use of power within the virtual environment as well as effectively employ options, such as power saving and redundancy. Depending on the hardware, you may also find settings that control the load balancing, resiliency or redundancy of the power supplies and power regulator chips on the motherboard. For more, deep technical readings on these features, I would suggest reading IBM’s whitepaper or Intel’s posting. Now let’s take a look at how VMware vSphere, Microsoft Hyper-V and Citrix System XenServer provide virtualization power management within their host clusters. VMware offers Power Policies, which can control, monitor and adjust power consumption in the ESXi environment. 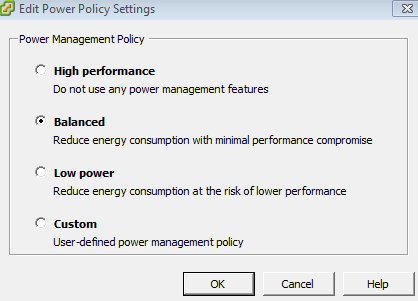 VMware vCenter comes with default, power-management policies, and there is an option to create custom ones. These policies control the BIOS power options. VMware also offers Distributed Power Management (DPM). In its simplest form, DPM is the mechanism that controls host-resource power usage. DPM effectively monitors the cluster hosts for their resource consumption and ability to adequately supply resources to the virtual guests. It constantly makes decisions based on this information and determines whether it can put those hosts into standby mode until the cluster needs those resources. VSphere Distributed Resource Scheduler (DRS) is a requirement for DPM. Because DPM can power down hosts, it has to be able to move VMs to other hosts within the cluster. Once the cluster needs access to the resources on the powered-off machine, DPM uses a Wake-On-LAN magic packet, Hewlett-Packard’s Integrated Lights Out (ILO) or the Intelligent Platform Management Interface (IPMI) to power on the host. DPM is disabled by default, and you should deploy DPM only after extensive testing to ensure that it can power your hosts on and off. The free Virtual Machine Manager (VMM) or System Center Virtual Machine Manager (SCVMM) are the control points for managing dynamic virtualization power management in Hyper-V. 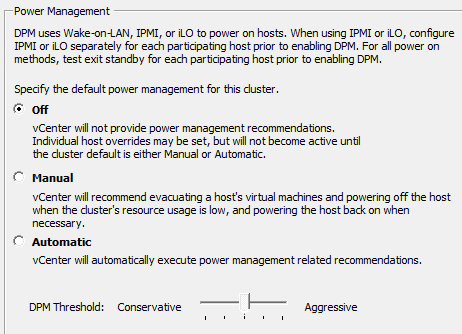 The Power Optimization option works basically the same as vSphere DPM. It turns hosts on and off in the Host Group (i.e., cluster) as resource are needed. It requires Dynamic Optimization, which is similar to vSphere DRS, in that it uses Live Migration to move machines dynamically. SCVMM also allows for virtualization power control in vSphere, XenServer and Hyper-V, which is really cool and convenient for multi-hypervisor data centers. I highly recommend reading the blog post by Microsoft MVP Mercelo Sincic on this excellent feature. You can also schedule Power Optimization to run only during non-peak times, when low power consumption is anticipated. In some instances, companies receive lower electricity rates when utilizing power during certain times, such as weekends. Additionally, some companies are hesitant to use Power Optimization during peak times, just in case something goes wrong. 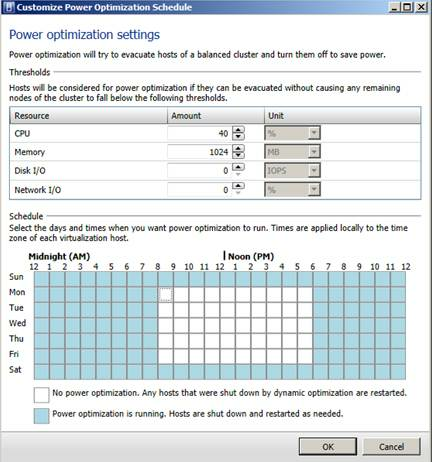 For more technical information on how to implement these virtualization power-management features in Hyper-V, check out this TechNet article. Sadly, once again, XenServer trails vSphere and Hyper-V in the implementation of intuitive features like power management. Citrix XenCenter provides a basic – and, by basic, I mean very basic – way to configure virtualization power management within a XenServer Server Pool. XenServer requires a Work Load Balancer server to provide dynamic guest movement to other host, similar to Hyper-V’s Live Migration and vSphere’s vMotion. And it also uses ILO and IPMI to control the hosts power state. The power-control company Eaton has created a XenCenter plug-in that allows for much greater power control in XenServer environments, but it is an added cost for functionality that is free in the other hypervisors. If you run XenServer with either vSphere or Hyper-V, I highly recommend that you install SCVMM 2012 to manage those hypervisors as well as their power management features. As with all of these feature sets and additional power-management products, I cannot stress enough that you need to test these mechanisms before implementing them in production environment. Do you run virtualization power management tools in your data center?